Now first let me say as co-founder, I do not endorse all opinions shared here at The BFRLC's Blog, but I am passionate about the big guy, and I am fascinated by BF's impact on us, especially here in the states. This blog is meant to be the biggest Bigfoot magnet ever made, with more drawing power than any film, book, or blog. As a child, my family camped every other weekend. The routes to our favorite destinations often included long eastbound stretches of I-90 at night. I-90 follows a path carved by ancient glaciers long gone, defining Oregon's northern border. It slices through miles of old-growth forest, nested between the Columbia River on one side and sky scraping cliffs on the other. like a classic Hanna-Barbara cartoon I-90's scenery seems to loop continuously without change until it bends near Corbett at exit 22 An outcropping of cliffs overlooking the Columbia Gorge named Crown Point. 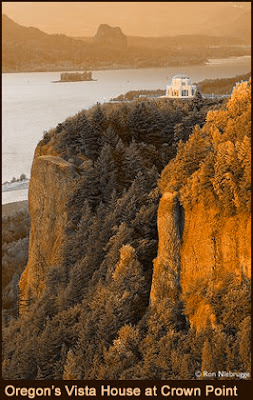 The jewel of this crown, set prominently like a precious stone, is the Vista House. Despite my curious nature, I never bothered to ask about the Vista House. For one, I wasn't sure if anybody else could see it. Besides, as a resourceful six year old, it was perfectly obvious to me. A building made of stone? Without any apparent roads to or from? Perched in the upon a cliff deep inside the forest? Simple. Bigfoot's castle. While siblings, family and friends guessed at cloud formations, looked for the big dipper or gazed at the moon, my eyes stayed fixed on the surrounding forest. After all, now I had Bigfoot's address, I was sure to spot him in his neighborhood. After 10-plus years, traveling past Crown Point literally hundreds of times, I never gave up, and I never did see him. Oddly I was never disappointed, each uneventful search only confirmed the rarity of this mysterious creature. I knew that Bigfoot was significant. At a single glance BF's upright posture reveals how he shares more with us humans than any other creature alive today. Once discovered we would learn as much about ourselves as we would of it. Eventually my interest in BF would lead me to human origins, anthropology, primatology, bio-mechanics and a sea of multiple personal accounts and sightings with as many different theories and counter-theories. As no two snowflakes or fingerprints are identical; the same could be said be said when it comes to any two Bigfoot theories. I am fascinated by them all, every single one, no matter how polished or rough. So stay tuned. Tomorrow I post a theory, of biblical proportions, aptly titled: Is Bigfoot My Brother's Keeper? IS BIGFOOT MY BROTHER'S KEEPER? BF SIGHTINGS & ORCHARDS LINKED?